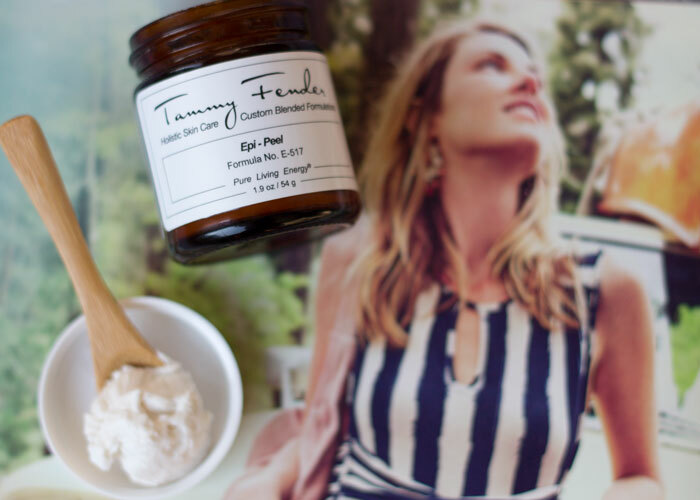 Dubbed the “facial in a jar,” Tammy Fender’s Epi-Peel lives up to its expectations as not only a relaxing facial treatment, but also as a gentle yet effective exfoliating treatment. Of the many facial scrubs currently in my bathroom (current count: 8), Tammy Fender’s Epi-Peel is the one I reach for the most (and have almost finished!). That’s also true for my boyfriend, who, when asked to use scrubs by yours truly, always remarks at how different the Tammy Fender one feels against his skin. If he can tell a difference, beauties, I know you will be able to, too. The texture of Tammy Fender’s Epi-Peel mimics the feeling of the finest white sands of the Caribbean — think extremely fine and gentle grains with soft grit that delivers the most skin-soothing results. That’s thanks to a thoughtful ingredients list that relies on Moroccan rosemary, spearmint and clay to create a revitalizing, oxygenating hybrid scrub-mask. These and other key ingredients help physically remove dead surface cells while polishing the skin. You definitely feel that glow and get a light flush thanks to the blood circulation this polish helps jump start in your body. Scent-wise, Tammy Fender’s Epi-Peel has a soft essence of rosemary and spearmint, but does not at all impart that tingly, minty-feeling upon your face (which can be irritating). Instead, you get mega doses of brightening orange and lemongrass as well as calming, antioxidant-rich organic grapeseed and sunflower seed oils. No matter how “common” those oils seem, they will always be favorites of mine thanks to their high concentration of linoleic acid — amazing for acne-prone skin — and moisturizing properties. In a blend like this, these oils are out of this world because of the support they provide the skin during the exfoliation process. Besides pure exfoliation (you know, the process of applying a scrub, massaging in a circular motion, and gently rinsing off), Tammy Fender’s Epi-Peel truly is multipurpose because of its wonderful capabilities as a mask. After doing the typical exfoliation ritual, instead of rinsing, I like to allow the polish to dry on my skin and further pull out impurities. It takes just five minutes to do its magic, and unlike many clay-based masks, Tammy Fender’s Epi-Peel doesn’t harden to the point of discomfort. That makes this scrub-mask an easy choice for weekly masking and exfoliation, especially for those of use looking to pare down our product supply. But, I do recognize that at $80 for a 1.9-ounce jar, this is expensive. With that said, you don’t need much — probably a nickel-sized amount — to get the job done, and if you’re only physically exfoliating twice a week (and perhaps doing a little acid toning in between when you really, really need it), you can make this little jar last for two and a half months or so. That’s with consistent use (and not like me, who’s constantly switching things up). Once I do finally pare down my routine (I’m getting there, I swear), Tammy Fender’s Epi-Peel has a place on my repurchase list. The texture is that good, but I admit it will be a treat to use every now and then for true spa nights at home. What are your favorite luxury and budget facial exfoliants? Have you tried anything from Tammy Fender? Tell me in the comments section!